Are you getting a lot of spam comments on your WordPress blog? Spam comments can become a big issue as your website grows. In this article, we will share how to use the Antispam Bee plugin to block spam comments in WordPress. Why You Should Block or Delete Spam Comments? Spam comments take up unnecessary space in your WordPress hosting database. What’s worst is if you accidentally approve a spam comment, then it makes your brand look bad. There are multiple ways to block spam comments in WordPress. You can do it manually by reading and deleting them one by one, but that could take hours. Alternatively, you can use the free Antispam Bee plugin to automatically block the spam comments based on the rules that you set. Let’s take a look at how to block spam comments in WordPress with Antispam Bee plugin. First thing you need to do is install and activate the Antispam Bee plugin. For more details, see our step by step guide on how to install a WordPress plugin. Once activated, you need to go to the Settings » Antispam Bee page in your WordPress admin area. 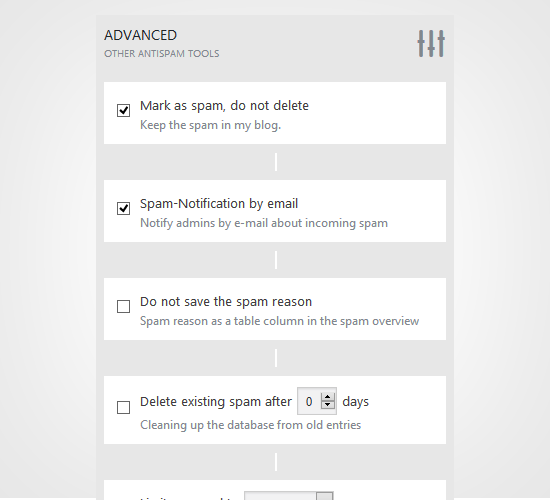 On this screen, you will see the Antispam Bee settings divided in three sections: Antispam Filter, Advanced tools and More options. 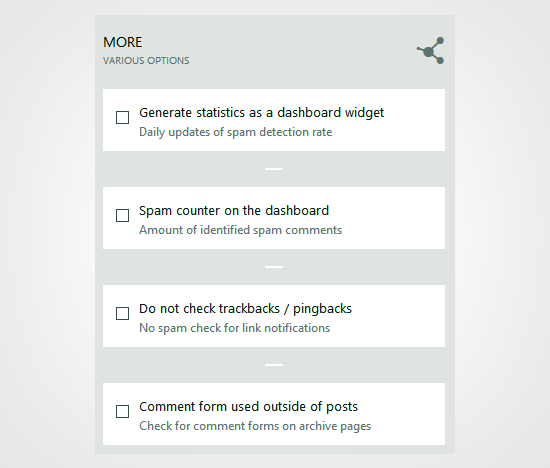 Antispam Filter settings are the basic settings that help you detect spam comments. This allows you to filter and review the comments before they show on your blog posts or website. These settings are organized in an order which they execute. We have explained each setting in the descriptions below. You can enable this option to automatically approve comments from regular and trustworthy commenters. These commenters may post valid comments and generate conversations on your blog posts, so the plugin remembers them and approve their comments right away. 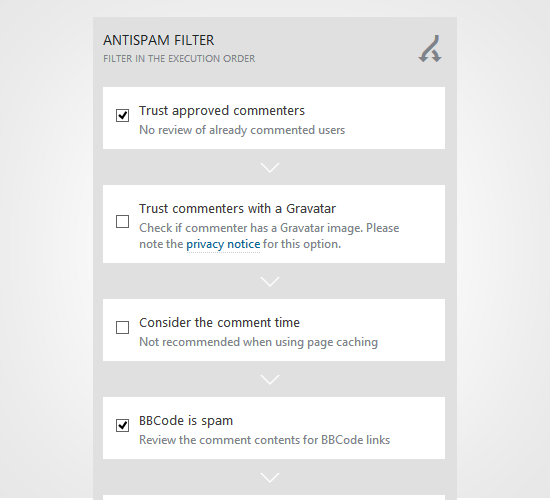 This setting will allow you to approve comments from users with a specific Gravatar image and posting valid comments. It is the same technique as approved commenters, but with this setting the plugin will remember the Gravatar of the trustworthy comment makers. If enabled, the filter will considers the comment time. This setting is not recommended by the plugin author for blogs or websites using page caching. It is a recommended setting to check comments with BBCode (Bulletin Board Code) links and mark them as spam. These links format are widely used by spammers to highlight words and links. The plugin allows you to validate the IP addresses used by the commenters to check their network information like hostname. This helps in finding the online background of the commenter to decide if the comment is useful or spam. If enabled, it helps in finding the unwanted comments with a set of predefined patterns that are useful to detect spam. If you check this option, it will look for the spam content on your site’s database and then treat it as you define further settings for the spam. This setting is linked with the Stop Forum Spam to detect IP addresses of active spammers and quickly check the history of the commenters. It works with the complete IP addresses of the senders, so the commenters from EU countries will be avoided. You can add the list of specific countries to filter spam comments. 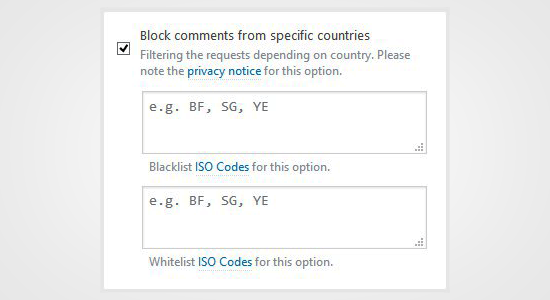 The Blacklist and Whitelist ISO codes are given with this setting, so you can easily declare the country codes in the respective sections. This setting allows you to specify a language for the commenters, so comments in all other languages will be blocked or deleted as you define later. In the advanced settings, you can further set the options to manage, block and delete the unwanted comments. There are few settings that are enabled by default however you can make changes to these settings as needed. If you enable this setting, it will keep the spam comments and won’t delete them until you enable the settings below. 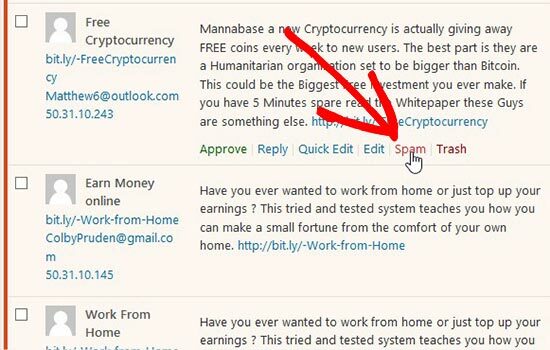 If you enable this option, then you will receive an email notification for every spam comment. We do not recommend this setting because it’ll become extremely annoying really fast. If enabled, this setting will not store the suspicious values of a comment in a separate column. These suspicious values can be the formatted links, comment time and more. This is an important option because it allows you to define the number of days after which the spam comments are automatically deleted. It is linked with many other settings that we discussed above about deleting the comments. This option will define whether you want to approve comments or trackbacks. If you limit approval to comments, then trackbacks will be automatically deleted. Similarly, if you limit approval to trackbacks, then the spam comments will be automatically deleted from your blog or website. In case this option is not enabled, it follows the previous settings. You can delete comments with predefined spam reasons. You can select multiple reasons from the options to delete the unwanted comments automatically. These advanced settings will make your life easy while reviewing comments on your site. After the advanced settings, you can take a look in the reporting options to display your daily spam updates on WordPress admin dashboard area. These reports will help you monitor the spam comments easily, and you can also analyze between the numbers of useful and unwanted comments. If enabled, this setting will create a spam report in an interactive widget for your WordPress admin dashboard area. These statistics will give you an overview about the spam comments on your blog. If enabled, it will display the number of total comments marked as spam in a prominent style. If you are deleting the spam comments, then it will also show the number of deleted comments in an additional column. Some new bloggers find it fun to look at this number after they first start their blog. By default, the plugin put a check on all the comments, trackbacks and pings. You can avoid checking the trackbacks with this setting. If enabled, the trackbacks / pingbacks from any site will be automatically approved. This option will monitor comments on your archive pages. Once you are done, click on the Save Changes button to apply these settings on your blog. That’s all. 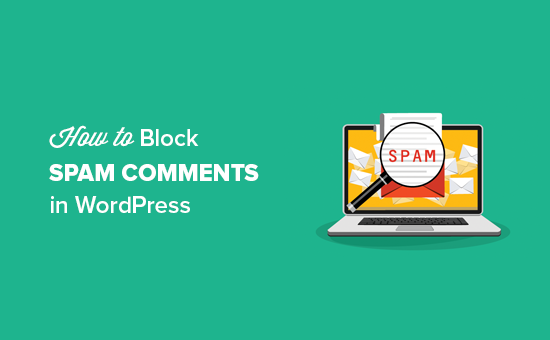 We hope this article helped you block spam comments in WordPress. You may also want to check out our guide on how to stop spam registrations on your WordPress membership site. The post How to Use Antispam Bee to Block Spam Comments in WordPress appeared first on WPBeginner.